Sonos has been synonymous with wireless home audio for a while now, allowing anyone the ability to set their own home up with interconnected wireless speakers, filling every room with sound. With the completely redesigned Play:5, they are hoping to build a new flagship; one that not only improves on the past iteration of the Play:5 but as will stand as a must-own flagship audio device. If our testing is anything to go by, they have managed this feat without question. The new Play:5 is a full $100 more expensive than the previous model Play:5, costing $500 ($549 CAD)—well above the $199 for the Play:1 and the $299 for the Play:3. What you get with this extra money, though, is significant. The new iteration of the Play:5 is revamped both inside and out. The new matte design will fit into any home and be a stylish figure your chosen room. Sonos wants their devices to stand the test of time in clients’ homes, and with the play:5, that’s obvious. Whether your preference is a black or white colour, the speaker will fit with most decors, ensuring it never feels out of place or an eyesore to the user. 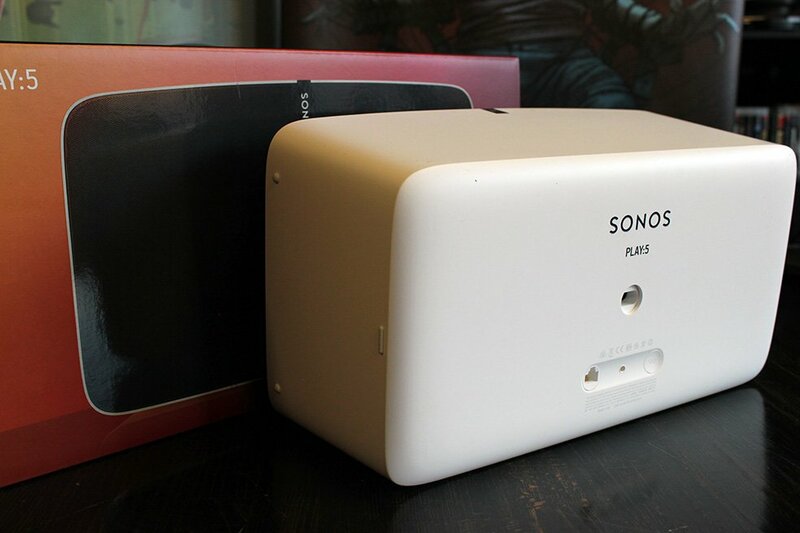 Even though the Play:5 works best while oriented horizontally, Sonos have built the speaker to know which face it’s resting on and automatically optimize itself for that particul setup. The new touch controls give easy access to needed features of the speaker when the app is not easily accessible, while sticking with the clean, sleek design that makes it such a pleasure to look at. Some clever additions, for sure. The new design also features 60,000 individual speaker holes in the new front polycarbonate speaker grille. Behind the sleek non-removable grille rests the heart of the speaker: six in-house-built drivers that allow it to create rich, clear, room-filling sound. The three tweeters and three mid-woofers provide a sound that is far and away above what you can find in comparable speakers. The sound is clean and crisp, while still managing to fill most rooms with rich depth. 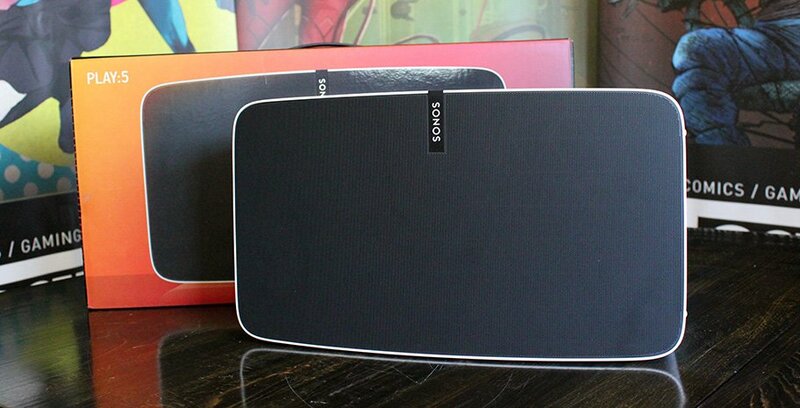 It’s something that many Bluetooth speakers claim to achieve, yet none can match the richness Sonos has managed. The real test for the Play:5 was the ability to play a wide range of music genres the way the studio intended. From the deep bass of Dubstep to the rich clean sound of Jazz, the Play:5 managed to play the music I wanted to hear, the way it was intended, for hours at a time. Never once did I feel that the sound was muddy, or lacking in depth. The fact that I could crank the Play:5 in a group setting without hearing any noticeable distortion is a true test of the quality of the drivers. Most Bluetooth speakers—and even the Sonos Play:1—could not come close to matching this ability. With many rival options sounding weak until cranked, the Play:5 managed to sound fantastic at any volume, ensuring it was always a pleasure to listen to. The real key to making everything sound so crisp with the Play:5 is the new Trueplay calibrator included in the new Sonos app. This new iOS-only ability allows the user to calibrate the speaker for the room and placement, ensuring that no matter where the speaker is placed and what the surrounding area is like, it will always produce the best sound possible. In testing, the short tutorial allowed us to get the speaker working fantastically within minutes, and the sound difference was like night and day. It is only a shame that this calibrator is only on iOS for now, since android users will be missing out on one of the Play:5’s best features. There are many multi-room audio options now on the market, yet Sonos manages to stay at the front of the pack, largely because the software they build and the speakers they offer are a step above what the competition offers. The Sonos app for iOS, Android, or Windows gives you easy access to all the audio services you could want, from Spotify to Apple Music, it is all easy and all available with the tap of your finger. Moving between services was easy, and having it all within one app ensures you will have no need to flip between apps to find the music or audio you want. For the gamers out there, the Sonos Play:5 has a few offerings that may make it a great fit for your house, as well. Not only can it be paired with the Sonos Playbar to act as the surround speakers for your living room, it now offers an audio line-in. This means you can easily hook up your PS Vita, or 3DS and have booming rich sound while enjoying your games at home. In testing, this was a great way to play, the sound from these games elevated the experience to a whole new level. If only there was a way to play it without the need for wires, but beggars can’t be choosers, I suppose. 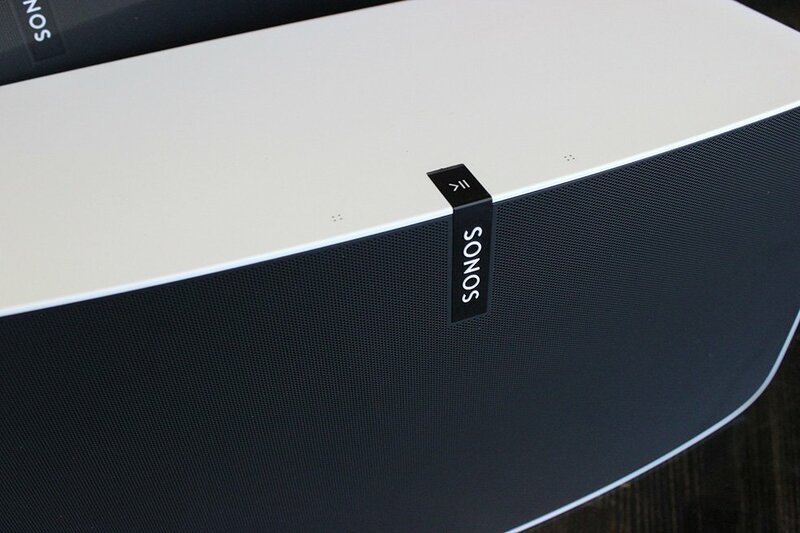 Pairing two Play:5 in an array with a Sonos Playbar will bring your music, movies, and games to a new level, entirely. With the Playbar, Sonos managed to build a setup that allows for a 5.1 audio experience that is hard to beat. Placing the Play:5 in the corner of the room, along with the Playbar and the Sonos Sub, and you will have yourself a sound system that would compete, without question, against the top products on the market. But with each Play:5 costing over $500, it’s certainly an option for only the most serious of audiophiles—ones with the disposable income to spare, no less. The real question for anyone looking to buy the Play:5 is if the cheaper options, the Play:1 or the Play:3, serve your needs. Yes, the Play:5 offers rich, clean, booming sound, but it does come at a price. The Play:1 and the Play:3 both offer fantastic audio, will work with Trueplay, and have the full range of Sonos abilities, at a fraction of the cost. They’re not be as loud, or quite as crisp, but still phenomenal options none the less. It would be a hard bet for anyone to fill their home with a Play:5 in every room, no matter how amazing that would sound. It all comes down to needs. If you need a speaker that fills your rooms with sound, then the Play:5 is your best option. It fits into a Sonos home well and with the new Trueplay ability and will be a hard speaker to beat. Sonos have clearly knocked it out of the park with this speaker and any audiophile would enjoy the sound it produces. 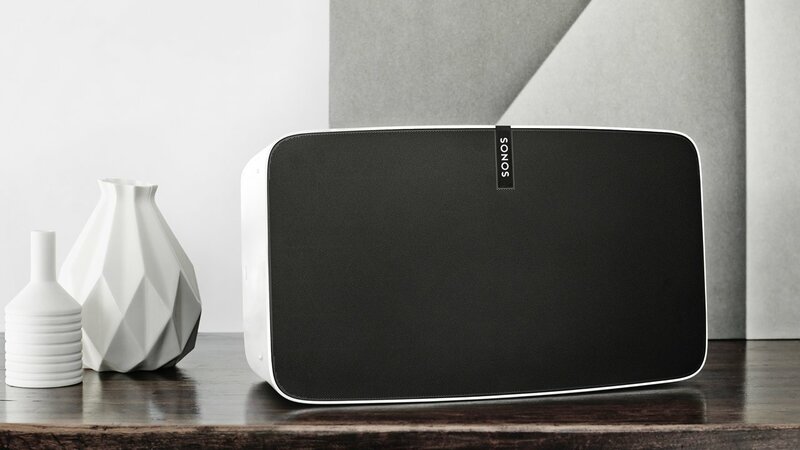 While The Play:5 may be the best speaker Sonos have built to date, the Play:1 and Play:3 are also fantastic options, meaning no matter the speaker you ultimately choose, you’ll be sure to enjoy sound that will take your audio experience to the next level. 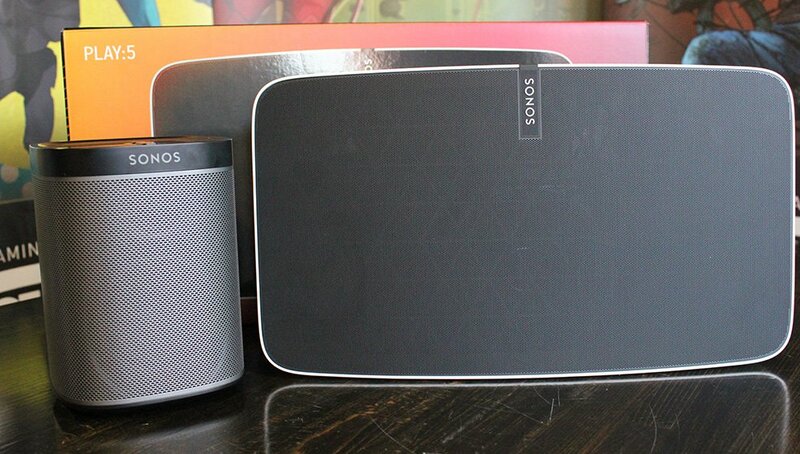 While The Play:5 may be the best speaker Sonos have built to date, the Play:1 and Play:3 are also fantastic options.